There is nothing I love more than the fall season and everything that comes along with it: the crisp chill in the air (it will arrive, eventually), autumn leaves, pumpkin spice lattes, and Halloween. Especially Halloween. Each year on my blog, to celebrate the season, I dedicate my October posts to what I call “Haunted Hollywood” locations—sites that have been featured in scary movies or television shows. I’ve decided it would only be appropriate to continue on with the theme here. On the hit ABC series Modern Family, matriarch Claire Dunphy (Julie Bowen) shares my affinity for Halloween and all-things-spooky. In the Season 4 episode titled “Open House of Horrors,” Claire’s realtor husband, Phil (Ty Burrell), informs her that he does not think she can be scary, so, donning a zombie costume, she sets out to terrorize him while he hosts an open house at an old Victorian residence on Halloween night. One of my good friends recently asked for my help in tracking down that Victorian and, using Google’s “Search by Image” (a genius creation that allows you to upload a photograph or, in this case, screen capture so Google can search the web for similar or matching images), I managed to find the place in a matter of minutes. The Miller and Herriott House in August 2014. The Miller and Herriott House in August 2014, courtesy of Lindsay Blake. In real life, the Victorian is known as the Miller and Herriott House, and it is located at 1163 W. 27th St. in University Park. The two-and-a-half story Eastlake-style dwelling was constructed as part of the Harper Tract development in 1890. While the architect is unknown, the United States Heritage Conservation and Recreation Service speculates that the property was designed by the Bradbeer & Ferris firm. The property is the last surviving home from the development and is Los Angeles Historic-Cultural Monument #242. Throughout its 124-year lifetime, the Miller and Herriott House served as a private residence, a boarding house, an apartment building, and a filming location. In addition to Modern Family, it appeared several times on the 1980s television series Flamingo Road. Today the property functions as student housing for USC. Oddly enough, only the exterior of the Miller and Herriott House was featured on the “Open House of Horrors” episode. 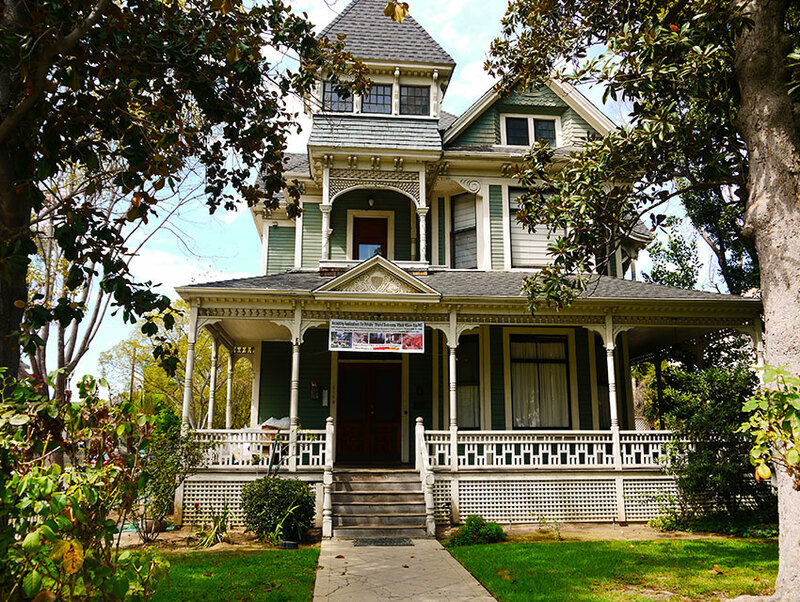 The interior scenes, in which Claire successfully scared Phil, were filmed about five miles away at another Los Angeles Historic-Cultural Monument, the Holmes-Shannon House at 4311 Victoria Park Dr. in Mid-City. That massive residence was constructed in the Craftsman-style in 1911 for Michael Francis Shannon, Los Angeles’ first traffic officer. While I will admit that the Miller and Herriott House is not particularly spooky in person, there is no way I would ever host an open house there by myself in the dark of night on Halloween. Next article5 Must-Try Foods at This Weekend’s Artisanal L.A.